There are two Fire TV Stick and 4K Fire TV accessories that we absolutely love, but we’ve always had a problem with them. First there’s the iPazzPort Bluetooth Keyboard, which adds a full QWERTY keyboard onto the back of your Alexa remote. 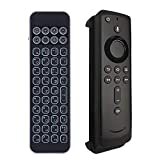 Then there’s the Sideclick Universal Remote Attachment, which clips onto your Alexa remote and adds programmable buttons that can control your TV. Do you see the problem here? That’s right, you can’t attach them both at the same time. The new iPazzPort Mini Bluetooth Keyboard with Infrared Learning Universal Remote takes iPazzPort’s awesome backlit QWERTY keyboard and adds eight programmable buttons that can control your TV. It’s finally time to say goodbye to every other remote in your living room.